I saw Xantcha spoiled for C18 and fell in love. Dismantled my Queen Marchesa (long may she reign) deck and built Xantcha from its ashes. This deck has taken on multiple forms from curses to forcing attacks to group slug to discard. Ultimately I settled on a little bit of each (except for curses) and so far I'm a huge fan of the way it's been playing out. This deck is Rakdos incarnate. The whole point of this deck is to accelerate the game as fast as possible, even if it means you might not be the last player standing. This deck carries just as much regard for your own life total as it does your opponents; just try to make sure everyone else is losing life at a faster rate than you. The best cards for doing this are your damage doublers. Dictate of the Twin Gods , Furnace of Rath , and Wound Reflection all pair up beautifully with your multiple sources of persistent damaging effects and big game-ending cards like Mob Rule , Insurrection , and Exsanguinate . This deck also has cards like Fraying Omnipotence , Pox , and Havoc Festival , which can get your opponents to a low enough life total that you can win without the help of damage doublers. So in short: deal damage, deal more damage, deal even more damage, double the damage if you need to, and try not to die from all the damage you're dealing. Follow this simple plan and you should be able to win! The meat of the deck. As mentioned in strategy, this deck slings a lot of damage around; even to yourself. The whole strategy is to get your opponents to a lower life total than you and keep them there until they're out of the game. Below are some key cards that will help you do exactly that. Ankh of Mishra & Zo-Zu the Punisher - Reliable damage while punishing decks who try and ramp by playing more than one land a turn. Manabarbs - Similar to the two cards above, it punishes decks that want to ramp with lands and play large spells while offering a source of consistent damage across the board. Rampaging Ferocidon - Unlike the above two cards, the damage this card deals is much less reliable because your opponents' decks might not be too creature heavy. Even though the damage isn't as reliable, the potential of this card against token/aggro decks could be devastating while barely effecting your life total. Citadel of Pain - Punishes anyone trying to play instant-speed spells, but is mostly in here as defense against counterspells and end-of-turn boardwipes. This deck doesn't run too many instants and, as a result, rarely needs to leave any mana open. We could either go the route of incorporating more instant speed interactions, or we could try and bring our opponents down to our level. In the spirit of punishing opponents, I love this card. Since Xantcha has an activated ability that both deals damage AND draws us cards, we want to use it as much as possible. Here are a couple of cards that help us do that. Braid of Fire - With the removal of mana burn, this card is just pure upside! The only reason it doesn't see much play is that you can only use the mana this generates on your upkeep and many decks aren't built to utilize this. The best usage of this card is when you have a mana sink in your command zone (which is why you mostly see it in Grenzo, Dungeon Warden decks); thankfully, we have exactly that. Neheb, the Eternal - What is this deck trying to do again? Oh yeah, a lot of damage. Neheb generating mana based on damage dealt means you can invest that mana into dealing even more damage! Whether that's in the form of dumping it into Xantcha's activated ability or playing some more punishing cards from your hand is up to you since this mana (unlike Braid of Fire) can be used during your second main phase. Coldsteel Heart , Fellwar Stone , Rakdos Signet , Sol Ring , Star Compass , Talisman of Indulgence , Expedition Map , and Victory Chimes - Your standard ramp cards. Helps us to get to larger amounts of mana much more quickly. Victory Chimes is a little gimmicky but I like it because it gives us the option to help our opponents pay for Xantcha's ability; like a one-time pseudo- Heartstone . Also Expedition Map helps us search up Cabal Coffers or Urborg, Tomb of Yawgmoth . Mana Geyser - This card just generates a HUGE amount of mana in a mulitplayer game. Either lets you throw down a bunch of punishing enchantments, pump a lot of mana into a Torment of Hailfire / Exsanguinate , or draw a bunch of cards from Xantcha's ability. 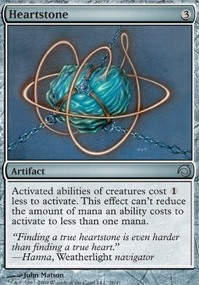 Heartstone - Doesn't generate mana but helps reduce the cost of Xantcha's ability by one for every player at the table. Saving you mana in the process and helping incentivize your opponents to use her ability more. Xantcha has the ability to make its controller attack every turn if able. While this theme isn't fully explored to its max potential in this deck, I definitely wanted to make sure I included some cards that help synergize with that gameplan. Disrupt Decorum - Possibly my favorite card in MTG history. This card not only forces your opponents to attack, but forces them to attack EACH OTHER. Really solid card and even though the price is starting to creep up on it, I feel it's massively underplayed. Rite of the Raging Storm - Similar to Disrupt Decorum this card makes your opponents attack each other and you give them the fuel to do it with. It kind of acts like a second Xantcha without her activated ability. Just be wary that you don't play this on the same turn you play Xantcha. If you do, make sure you give Xantcha to the player on your right. That way you reduce the risk of having another player attack the Xantcha controller with a lightning rager; giving Xantcha's controller a chance to block with her. Insurrection and Mob Rule - If your opponents won't attack with their creatures, you can attack with them instead. These cards are primary win conditions in the deck, especially when paired up with one of the damage doublers. War's Toll - Makes Xantcha's controller also swing with everything else they control. Has the added upside of also making sure our opponents are usually tapped out at the end of each of their turns. This might feel like it conflicts with the "Combat Manipulation" section. Even though we want our opponents swinging big creatures at each other as much as possible, we also want to be able to make sure that things don't snowball out of hand. Us having enough removal helps us ensure that things stay chaotic without getting too terrifying. Last One Standing - One of my favorite boardwipes ever printed. 3 mana to clear everything except for one random creature? Given the amount of creatures played in a standard game of EDH, the one creature standing is almost never a downside. In the best of cases, you could randomly choose a creature that you control! Blasphemous Act - Another super cheap boardwipe that should clear practically everything aside from indestructible creatures. This card will almost always cost under 4 mana whenever you want to cast it. Toxic Deluge - Another cheap boardwipe (are you sensing a trend here?) and arguably the best boardwipe in EDH aside from maybe Cyclonic Rift . Pox & Fraying Omnipotence - Not quite a boardwipe in the traditional sense, especially since the creatures you're trying to destroy will most likely stick around. That being said, they still reduce their board state, lower their life total, and make them discard cards; all things this deck wants to do. Terminate & Bedevil - Cheap single-target removal cards. Great for taking out problematic utility creatures or some scary creature heading your way. Also can be used to take out Xantcha if she ends up back under your control. Pyrohemia & Pestilence - Lets us pump mana into these to deal some damage and clear the board (preferably leaving a creature like Xantcha alive). Much like ramp and removal, card draw is one of the essential pillars of any deck. Unforunately, red doesn't draw cards in the traditional sense (looting & impulse draw) and black draw wants you to pay life. Both aren't ideal for this type of deck, but here are the best ones that I could find. Necropotence - Even though this deck doesn't have a lot of life to play with, Necropotence is just SO good that it's hard to make an argument for not including it. It gives you so much card advantage that it feels like a win condition on its own. Outpost Siege - Choosing Khans gives you access to reoccurring impulse draw. Because our CMC is relatively low, you should be able to cast whatever card is flipped if you want to. The biggest downside is that it triggers on upkeep; meaning you don't get any benefit from this card the turn that you play it. Theater of Horrors - Similar to Outpost Siege it's not "exactly" card draw but it is a great way to start gaining card advantage. Also with the amount of small damage this deck has (including being able to activate our commander), the spectacle "drawback" isn't that difficult to achieve in this deck. Phyrexian Arena - Not the biggest fan of this card since it waits until your upkeep to gain any advantage from it (similar to Outpost Siege ) and it loses you life. Both are pretty large downsides for this deck, but given the options that we have access to in black/red, it's one of the better ones we can choose. Throne of the High City - Will at least draw you one card from the monarch ability but is mostly in here to give away and have your opponents fight over it. Any way to encourage your opponents to attack each other is a great addition in my book. 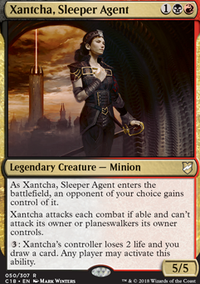 Xantcha, Sleeper Agent - Our commander itself is a draw engine! Especially when paired up with cards like Braid of Fire or Neheb, the Eternal she helps you draw cards when you need them most. Another interesting route to take with Xantcha is to force opponents to discard. Causing opponents to discard accomplishes two things for this deck. First of all it incentivizes our opponents to draw cards with Xantcha's ability to refill their hand. Second of all it limits the amount of interaction our opponents have to remove Xantcha from the board. Syphon Mind - Makes our opponents discard a card while we get to draw (hopefully) 3. Just drawing 3 cards for 4 mana with no drawback might be good enough to run in the first place; having our opponents discard is just the cherry on top. Bottomless Pit - Forces us to discard too, but even symmetrical discard is fine for this deck since we want to use Xantcha's ability too. Also symmetrical discard's effect is less detrimental to us if we have cards like Outpost Siege and Theater of Horrors online since they give us cards to cast that aren't in our hand. Captive Audience - Discarding their hand is one of the modes, but honestly this card is just in here for the fun of it. If not removed it's basically a win-condition in a single card. Throw it on a player without green or white for a higher chance it doesn't get removed. Pox & Fraying Omnipotence - In addition to removing some creatures and breaking down some life totals, it also has people discard cards too! It's a bummer that it removes Xantcha as well if she's on the board, but I think it's worth it for the effect. Painful Quandary - Even though they get the choice to discard or lose life, we are fine with them choosing either one. Even though this deck is all about slinging around damage, we still want to try and win somehow. To do that, we need to mitigate the amount of damage we take over the course of the game. Glacial Chasm - Good way to stave off some damage in the late game. We don't want to play this too early due to the cost of having to sacrifice a land and the cumulative upkeep of 2 life; but once the game is nearing a close this card can keep us alive. Crawlspace - Stops us from getting blown out from swarms of tokens. Maze of Ith & Spires of Orazca - Can stop a big creature from knocking us out or keep Xantcha from swinging into a bigger creature to destroy her. No Mercy - Discourages our opponents from attacking us altogether unless they want to lose their creatures. After a lot of consideration, I have also included the Animate Dead + Worldgorger Dragon combo in this deck. In short, you have to have Worldgorger Dragon in the graveyard and reanimate it with Animate Dead or Dance of the Dead (or Necromancy ). I've also included Final Parting in this deck to tutor for both combo pieces. Reanimating Worldgorger Dragon will cause it to exile all permanents you control (including your lands and Animate Dead ). When Animate Dead leaves the battlefield, the Worldgorger Dragon will be sent back to the graveyard and all your permanents will be returned. With Animate Dead returning to the battlefield, you can select Worldgorger Dragon from your graveyard again. The key part of this combo is that in response to the Animate Dead trigger you are able to tap all your lands to float mana before they're all exiled again. Animate Dead resolves, Worldgorger Dragon enters the battlefield, it exiles all your permanents and then the loop happens again. This nets you theoretically infinite mana by being able to float mana everytime this loop happens. With that infinite mana you are able to activate Xantcha's ability to knock out an opponent. When she goes back to your control after you knock out your opponent you are able to exile her with the Worldgorger Dragon loop and put her on the battlefield in another opponent's control and repeat that process until you hit your Torment of Hailfire / Exsanguinate or until you deal enough damage to win. Lastly, I just want to say thank you. Waking up and seeing my deck reach top 10 put a smile on my face for the day. I love getting to build decks and share those ideas with people, so having a deck that I built reach #3 on the ranking made me a lot happier than it probably should have. I'm glad you all enjoy the deck and, as always, please leave any suggestions you have that you think would make it better! I've made quite a few changes to the deck since the last update on August 28th. Since the deck has been in a constant state of flux I'll just list some of the most notable additions/removals. Crypt Ghast , Urborg, Tomb of Yawgmoth , and Cabal Coffers -- More ways for this deck to generate large amounts of mana to sink into Xantcha or just to play spells. Worldgorger Dragon , Animate Dead , and Dance of the Dead -- Infinite combo to win the game on the spot if your opponents don't have interaction. I describe it in depth in the description. Bedlam -- We run very little creatures so we don't care about blocking and this stops opponents from chump blocking Xantcha or blocking with a big enough creature to remove her. Sire Of Insanity , Pain Magnification , and Necrogen Mists -- The discard route wasn't as great in playtesting as I had originally hoped. I still like running a bit of discard in this deck but I felt like these 3 cards were the worst of the ones I was running. Heartless Hidetsugu and Dire Fleet Ravager -- Heartless rarely ever had the chance to untap and Dire Fleet isn't as great if you don't have a way of replaying it. Harsh Mentor -- Discouraged opponents from ever activating Xantcha. Rakdos, lord of the lets start a riot.